Shopkeepers who greet you with a “bonjour!” A hotel that reminds you of chateaux from the Loire Valley in France. 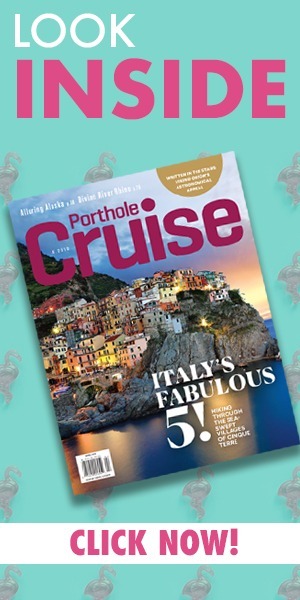 Old-World style cafes and narrow cobblestone streets bordered by quaint stone buildings. Quebec City, the capital of the Canadian province of Quebec in Canada, is located on the banks of the St. Lawrence River and is often touted as an affordable alternative to a trip to Europe. I say “oui” to that, particularly when I do not want to endure – and pay for – a long transatlantic flight. An eminently walkable city – though hilly – Quebec City also has a hop-on/hop-off bus that is convenient to get oriented and to get to various attractions when time and energy are short. A double-decker open-top red bus from Old Quebec Tours, it makes 14 stops including one at the Museum of Civilization (Musee de la Civilisation, 85 Rue Dalhousie, a block away from the cruise pier). 1. A walking tour of the UNESCO World Heritage Site Old City, the only walled city in North America north of Mexico with its charming Place Royale, is a major highlight. 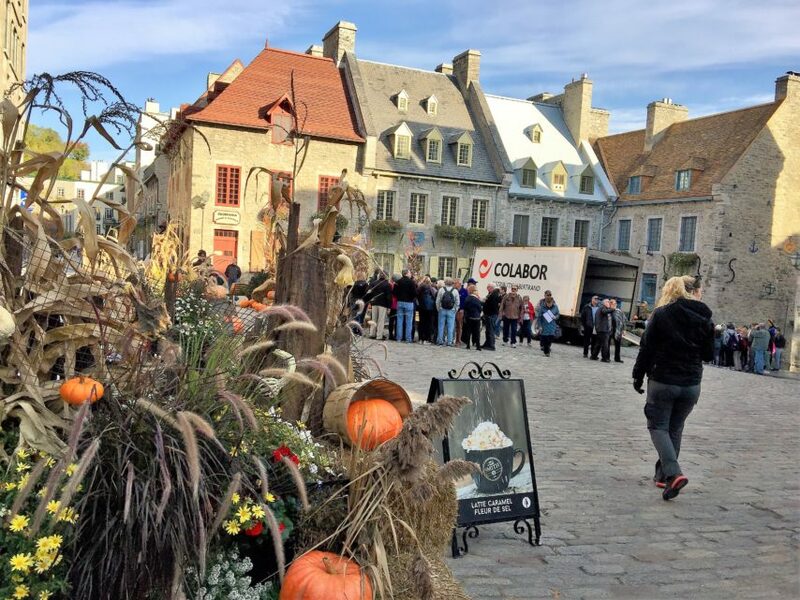 Here, a short walk from the cruise pier, visitors can walk along the city’s fortified walls on some of North America’s oldest streets and snap photos of attractions like the Quartier Petit Champlain, the oldest shopping district in North America on the southeast corner of Old Quebec that is filled with boutiques and cafes that spill from restored houses – you can climb the steep Escalier Casse-Cou (the Breakneck Steps, the city’s oldest stairs built in the 17th century) or take the funicular for panoramic views of the city. 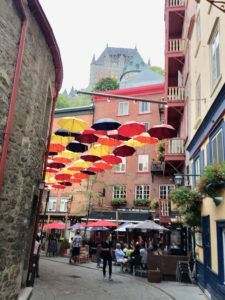 A highlight is the Rue du Cul de Sac, near the Place Royale, with colorful umbrella art overhead – locals told us that different objects, including chandeliers, hang at different times of the year. Other attractions include the Notre Dame de Quebec Basilica, rebuilt several times in the same spot since the 17th century and boasting a gilded Neo-Baroque interior, and the Citadel, a 19th century British-built fortress. 2. 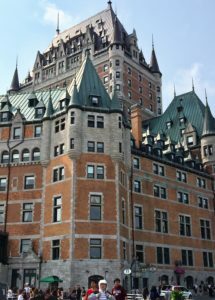 The castle-like Fairmont Le Chateau Frontenac Hotel is arguably the most photographed hotel in the world. It is celebrating its 125th anniversary this year. On our last visit we did more than photograph it, enjoying a wonderful tea ceremony at its Place Dufferin restaurant with delicious sandwiches – cream pie with smoked salmon, smoked ham from Damien with green pepper brie sandwiches, and blue cheese lollipops with caramelized macadamia nuts, anyone? And we followed those delights with a selection of teas, warm, heavenly-delicious scones and homemade jams, Devonshire cream and pastries created by Chef Stephane Modat and his team at this elegant property. Don’t miss the Salvador Dali bronze, “La Danse du Temps” (the dance of time) showcasing one of his famous melting clocks near the hotel entrance. The beautiful Dufferin Terrace, a seaside promenade with views of the St. Lawrence River, is at the foot of the Chateau Frontenac. 3. Montmorency Falls is a 272-foot high cascade (nearly 100 feet higher than Niagara Falls) situated about 15 minutes from downtown Quebec City. You can take a cable car up the cliff to start a walk at the Manor where there are an interpretation center, shop and restaurant. Following the footpath along the top of the cliff you can reach a suspended bridge for panoramic views of the area. Further along the path there is a 487-step staircase that takes to the base of the falls.And for the intrepid there is a zip-line. 4. Ile d’Orleans is an island situated 15 minutes away from Old Quebec via a bridge connected to the mainland. A visit here is like time-traveling back to 18th century rural Quebec. The island is dotted with farms, strawberry fields, artisans’ outlets, churches and 18th and 19th century heritage homes. Stop at some of the farm stands for tastes of local products including fresh apples and strawberries, apple butter, cider and delicious jams. Yum! 5. 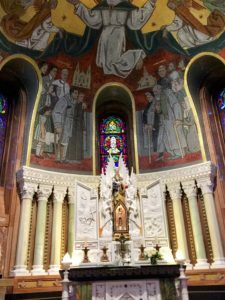 The St. Anne de Beaupre Shrine has been a pilgrimage site for 350 years. Dedicated to St. Anne, the mother of the Virgin Mary and grandmother of Jesus Christ, it is located 20 minutes from downtown Quebec City. The shrine is a peaceful place, adorned with stained glass windows, sculptures, paintings and mosaics. 6. The Plains of Abraham is a historic area within The Battlefields Park in Quebec City. 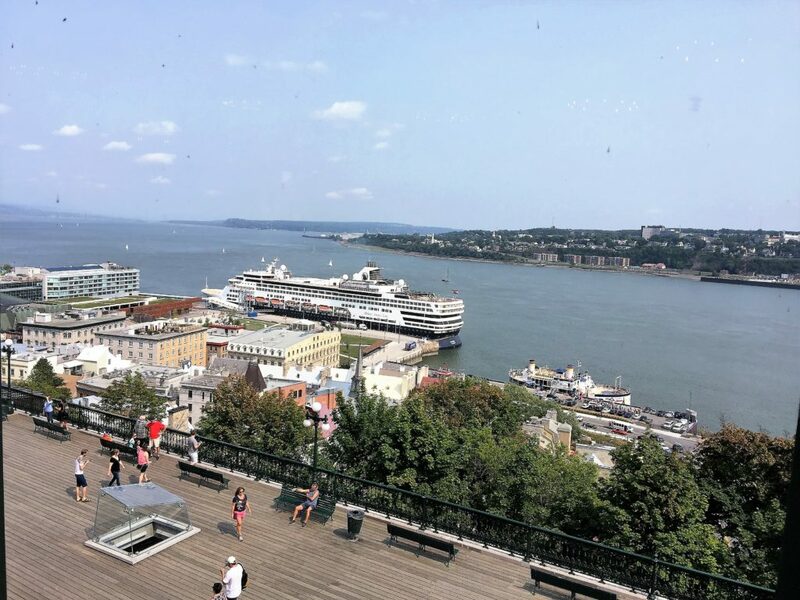 It is the site of the 18th century battle between the French and the British which was won by the British, leading to the surrender of Quebec City to them. The park is to Quebec City what Central Park is to New York – the lungs of the city, with acres of meadows and grassy knolls. 7. The Aquarium du Quebec boasts nearly 10,000 specimens of 300 species of marine creatures. Highlights include the Awesome Ocean Discovery Tunnel for up-close views of marine life and habitats showcasing polar bears, walruses and seals. A pavilion features exotic jellyfish, rays and sea horses. The Aquarium is located at 1675 Avenue des Hotels, overlooking the St. Lawrence River.